LOS ANGELES, CA--(Marketwired - Aug 10, 2016) - Blaze Fast-Fire'd Pizza, the fast-casual artisanal pizza concept known for its chef-driven menu and casually hip restaurants, today announced the introduction of its Agua Fresca drinks. 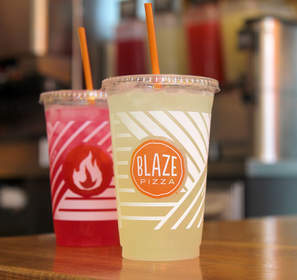 Made in-house and available in Prickly Pear and Key Lime Mint flavors, the beverages are available at Blaze Pizza locations nationwide, and expand the company's signature beverage options beyond the existing fan-favorites, original lemonade and blood orange lemonade. Agua Fresca drinks are available for self-service refills as guests please. Developed by Executive Chef Brad Kent, Blaze Pizza's Agua Fresca drinks are lightly fruit-infused and under 100 calories per serving. With the company's 150th restaurant now open, Agua Fresca continues Blaze Pizza's commitment to providing signature beverage options made with real fruit and without high fructose corn syrup. Guests that have the Blaze Pizza mobile app, available for iOS and Android users, are also "fire'd up" about the free Agua Fresca "pop up" promo offer that's just appeared in their reward accounts, inviting them to enjoy their first Agua Fresca "on the house." "Our hundreds of thousands of fans on social media consistently tell us how much they love our signature beverages," said Jim Mizes, president & COO of Blaze Pizza. "The introduction of Agua Fresca drinks gives our guests another delicious, lower-calorie option, and aligns with Blaze's mission to provide elevated-quality offerings across our menu." The first Blaze Pizza® restaurant opened on Aug. 6, 2012, in Irvine, Calif., and quickly gained attention for its chef-driven recipes, thoughtful interior design, and a service culture that celebrates individuality. Now ranked as the leading fast-casual pizza chain in the Technomic Top 500 Chain Restaurant Report, Blaze Pizza is building momentum and developing a cult following as it expands across the country. The company currently operates 150 restaurants in 31 states and Canada, including the major metropolitan areas of Los Angeles, New York, Chicago, San Francisco, Toronto, Dallas, Las Vegas, and Boston. Founded by Elise and Rick Wetzel (co-founder of Wetzel's Pretzels), the concept is backed by investors including LeBron James, Maria Shriver, Patrick Schwarzenegger, Boston Red Sox co-owner Tom Werner and movie producer John Davis. For more information, please visit blazepizza.com and facebook.com/blazepizza or click here to view a company video.